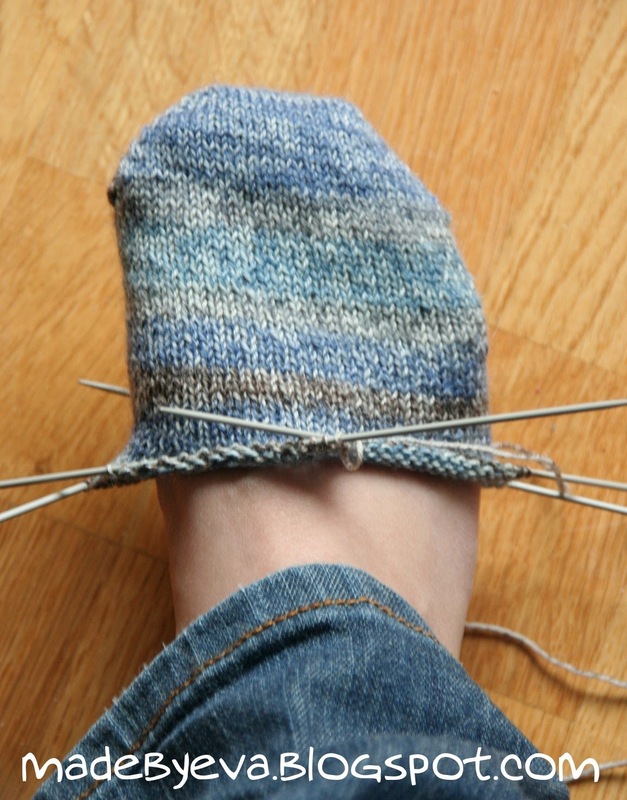 The knitting projects seem to have completely taken over this little blog lately! If you come here for paper related projects, I apologize. There are a couple of cards in the works, but I can't share them yet. And this is, after all, a blog for "all my projects, large and small", as you can read right at the top of this page. It just so happened that cards were the dominating projects for quite a while... ;) Lately I haven't been able to spend much time at my desk without feeling a bit sick, so yarn related stuff I can do quietly in a comfortable chair suits me much better. I like to have a small knitting project to bring with me here and there. The felted slippers I'm working on is a test project for some potential christmas gifts, so I needed an alternative to bring when meeting certain people (who don't read my blog)... ;) This is a very basic toe-up sock pattern, knitted in DROPS Fabel. Don't you love the first line in the pattern? "Warning! Written in excruciating detail!" That sounds like an excellent choice of pattern to me. 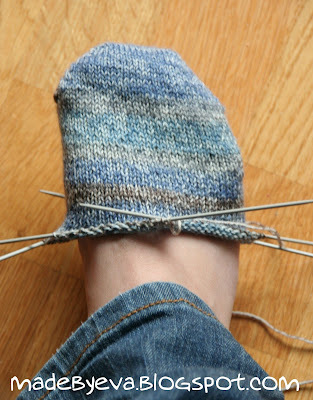 ;) I love the look of the short-row toe! It's my first pair of socks for adults and it's a new world of knitting terms and tricks. Details on my Ravelry page.